Just as messy and chaotic as ever, in fact I could probably use an old picture and you would never known. On the mat is a card I am making for a swap, but I can't show you it in detail as the lady who will, hopefully, receive it on Thursday morning sometimes posts her desk on here, and it would be unfair if she sees on here before having it in her hand. 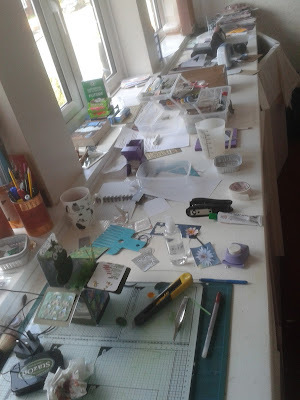 If I manage to blog next week I will show you the finished article. 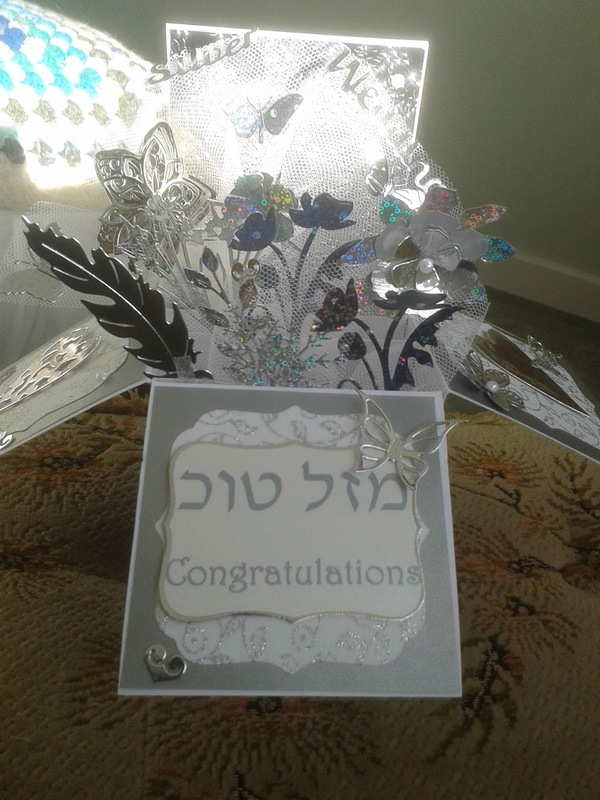 Instead I will show you a couple of recent makes, the first a Silver wedding card for my sister. I don't think the picture does it justice, all the silver reflects the light and makes it hard to see some details. And this one I did for a neighbour's 60th. It was fun to do this one, once I had mastered the technique of getting the cascade card working and threw away the bit I prepared beautifully then messed up because I didn't concentrate on what I was doing. 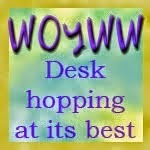 Well that is all for me, I will try to visit lots of desks and I will certainly visit if you leave a comment. To lovely cards Chris. I really must make another box card as I enjoyed making two last year. Hello there Mrs D!! Good to know you're ok and crafting away. 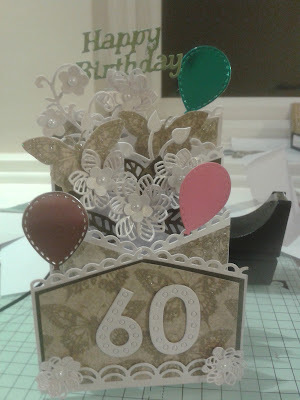 I love those explosion cards you've made...the silver does come across as being sparkly and that 60th is just fun!! Love the cards - I should think the recipients would be really pleased. What a lovely well-lit workspace!! beautiful cards, I do love the card in a box ones and yours if really stunning, I've made quite a few and they take me ages! Thanks for bringing that gorgeous silver card for us to see "live" - and the other card is just lovely. Well done! Was good to see you the other day - no, I'm sure you didn't leave the infection behind you!!! Probably John already had the start of it. He's heaps better already - has come off the O2 today. Nice to read you had been stamping with Margaret (via email from Margaret) - it certainly brightened her day. Lovely to see those two cards and I think the first one does show us how beautiful it is but then they are both so beautiful it would be hard to choose a favourite. I love your cards!!! I just made my first box card the other day - yours are fabulous!!! Nice to see you back! BEAUTIFUL cards. Hi Chris good to see you and Margaret both back this week double blessing .. and well so agree on desks they dont change a great deal do they? 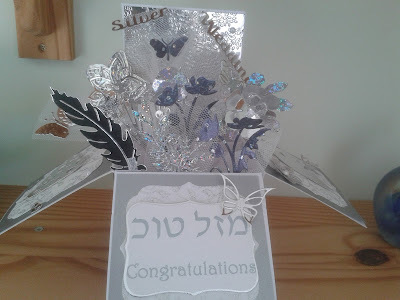 but the output does and thats what matters.. wondering if that is Hebrew on the silver wedding anniversary, looks awfully like it .. well made both of them! Thanks so much for popping over and for sharing. Lovely to see you MrsD! I do love your worktop/landing strip desk in action. You're in erm, good company with all the stuff out...but look at your results, those cards are stunning..so much work!